I cannot wait to check out Eric Burdon when he comes out this way; the last time I ran into him was at a concert KXBS oldies radio station put on at State Beach back around 1992. 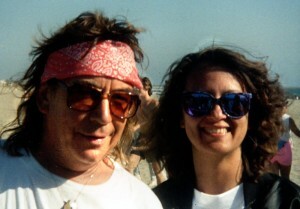 Burdon (yes, THE Eric Burdon from The Animals and War fame) will be headlining a show at the Libbey Bowl in Ojai on May 17th and I’m hearing it’s Eric’s 73rd birthday so we’re expecting quite the celebration. Opening the show will be the Rubberneck Lions and Dishwalla. The Ventura Music Festival is in full swing during the month of May, and the powers that be have really outdone themselves this year with a stellar line up: May 2 it’s Igudesman & Joo, a Little Nightmare Music at Community Presbyterian Church; Ventura High plays host for several shows including Lynn Harrell, Dean of American cellists on May 3; an evening with Judy Collins on May 4; and Stanislav Khristenko, 2013 Cleveland International Piano Competition Gold Medalist, on May 9. Check out www.VenturaMusicFestival.org for even more shows, ticket pricing and availability. Depending on your mood, the Ventura Theater has some cool shows in May. If you’re looking to burn off steam, punk rockers, Against Me! will be in the house on May 27, but if you’re looking to dance off some energy, you won’t want to miss the ever popular Reverend Horton Heat and their brand of psychobilly on the 23rd; and finally if you’re feeling a little more mellow and ready for some reggae, then it’s The Green for you on May 26. Ventura Music Week is coming up! Don’t even think about scheduling your vacation between June 6 and June 15th. Just some of the events to look forward to include the annual SRO benefit with the Stoneflys, Highway Starr and other bands; there’s the Roadshow Revival’s: a Tribute to the Music of Johnny Cash; Louden Guitars will have a special showcase at the W Gallery with some amazing guitarists including our very own Shawn Jones; there will be a special screening of the Oscar winning documentary, “20 Feet from Stardom”; an evening of visual arts up at City Hall’s Atrium, and more music than you can shake a stick at. Do check in at www.VenturaMusicWeek.com for more details as they come in.